Chintamani Nagesa Ramachandra Rao is a prominent personality who stood out in the field of structural chemistry. Born in Bangalore on the 30th of June, 1934, Rao did his schooling in Bangalore and certain other towns in the state of Mysore. After obtaining his B.Sc degree from Mysore University in the year 1951, and a subsequent M.Sc from Banaras Hindu University in ’53, Rao went for his graduate programme to Purdue University in the United States. He predominantly worked under Professor RL Livingston for his PhD degree in this phase. Bangalore has become a city without a soul. Everybody is moving towards IT. Everybody wants to make money. They walk with tie and suitcases, but have nothing in their head. Rao is a National Research Professor, Linus Pauling Research Professor and Honorary President of the Jawaharlal Nehru Centre for Advanced Scientific Research in Bengaluru. He had also worked as the Chief Science Advisor to Prime Ministers of India. Joining as a lecturer in the Indian Institute of Science in Bangalore in the year 1959, Rao moved to IIT Kanpur in 1963, where he rapidly rose to become a Professor and subsequently chaired the Department of Chemistry. He went on to become the Dean of Research at the institution. His notable achievement is having set up the Solid State and Structural Chemistry and the Materials Research Laboratory at the IISC, which he heralded till the year 1984. His initiative also spreads across having been instrumental in setting up the Jawaharlal Nehru Centre for Advanced Scientific Research in ’89. He was the Founder-President of the centre here. Rao currently is a National Research Professor, as well as a Linus Pauling Research Professor, apart from being a Honorary President at the Jawaharlal Nehru Centre for Advanced Scientific Research in Bangalore. CNR Rao’s contributions are multi-fold. His constant contribution to the development of the solid state and materials has been running for a time span of more than five decades. He was the main figure behind the study of transition of metal oxides, and his research led to the essential conceptualization of the phenomenon and established the relation between structural chemistry and materials properties beyond doubt. His contributions to the field of nano-materials also deserve mention here, besides his consistent efforts in the field of hybrid materials. He has authored over 1,500 research papers and also been an author/editor of over 42 books. Rao’s accolades earned him a place in the board of the Science Initiative Group as well. Prof Rao has been bestowed with about 70 honorary doctorates. 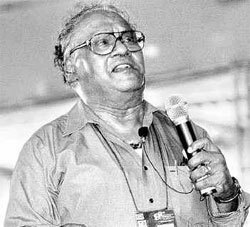 Prof CNR Rao has been awarded many international prizes, the list of which is nearly endless. The first recipient of the India Science Award, initiated by the Government of India. In November 2013 the government of India announced its decision to award Bharat Ratna, India’s highest civilian award, to Prof Rao. President Pranab Mukherjee presented the Bharat Ratna to Prof CNR Rao on Feb 4, 2014. The Emperor of Japan conferred Japan’s highest civilian award, the Order of the Rising Sun, Gold and Silver Star for his outstanding contributions to science and Indo-Japanese science coperation. Rao is also the only Indian to be elected as a foreign member of the Japan Academy in Jawaharlal Nehru Centre for Advanced Scientific Research.